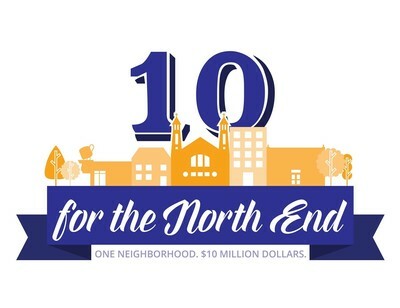 Last year, we set an ambitious goal to generate and recognize $10 Million dollars in public and philanthropic investment in the North End neighborhood. I’m proud to say we are well on our way, and after this construction season is complete, we will have surpassed our goal. Below are just a few of the projects underway now in the North End. To receive real-time updates and follow our path to the $10M mark, visit www.facebook.com/tenforthenorthend. Sylvan Field and Play Area Renovation: Construction is underway! Sylvan Park is a 3 acre neighborhood park with amenities that include an athletic field, a play area, and a restroom building. The current field and playground are substandard. This summer's project will include a multi-use synthetic turf fields that are designed to meet today's recreational needs. Improvements to the play area include replacement of equipment and surfacing. Marydale Play Area and Kato Courts: Marydale Park is a 23.95 acre neighborhood park. The park primarily provides a natural resource area offering trails throughout the park and around Loeb Lake, fishing pier, picnicking area, restroom building, parking lot, and a play area. The project will provide modern play area equipment and surfacing. This will enhance the park's site features and will fill the family oriented activity needs of in the adjacent diverse neighborhood, including Kato courts. Construction begins soon. Wheelock Parkway/Grand Round: At last! The street reconstruction of Wheelock Parkway will be underway in the coming weeks. Wheelock Parkway is also the east/west leg of the Grand Round, which is a 30 mile recreational trail that circles the entire city. Two years ago, the section between Rice and Edgerton was completed. Last year it was Como Lake to Danforth. This year, Danforth to Western will be fully renovated from sewer to gutter, street lights to sidewalks. The Grand Round project narrows the road bed to help slow traffic. In addition, a recreational path will be added along the south side. Next year, we expect to see Western to Rice rebuilt and the connection between Lake Como and Lake Phalen will be complete! The brand new road, multi-use path and sidewalks will put the “Park” back in Wheelock Parkway. Rice and Larpenteur Gateway Vision: Saint Paul, Roseville and Maplewood have come together to create a shared vision for the Rice and Larpenteur intersection and surrounding area. The area has a growing population and lots of commerce, but feels neglected. Not anymore. Each city has adopted the vision and is putting resources into improving the area. Additionally, Ramsey County is looking at re-designing Rice Street in the next several years, and shares our goal to make a safer, more welcoming gateway into our community. Saint Paul has awarded the project $350,000 in Commercial Vitality Zone funding to begin capital improvements. Rice Street Transportation Study: Ramsey County is making a plan to start reconstructing Rice Street incrementally over the next 5 years. So far, they have collected data and gotten community feedback. For many, walking on Rice Street and crossing has felt unsafe. I am encouraging Ramsey County to make traffic calming and pedestrian safety a priority in their design. Washington Technology Magnet Safe Routes to School: State and city funding was awarded to make walking and biking to and from school safer for students at Washington Tech. This summer, bike amenities will be added to Arlington Ave east of Rice Street as part of a planned mill and overlay project. Next year, the city will complete technical design on safety improvements around Washington Tech recommended in the plan (including sidewalk infill and bump-outs), with construction beginning in 2020. These improvements, combined with Ramsey County's safety study for Rice Street, will ensure a much safer route to school by the time today's underclassmen are upperclassmen. Como, Front and Dale: Commercial Vitality Zone funding was awarded to this project in 2016 and construction will be done this year. The improvement will include bold crosswalk and bicycle lane markings, landscaping improvements, public art and opportunities for exterior improvements for the local businesses. Maryland Ave. Home Ownership Project at Willow Reserve: Saint Paul is awaiting word from Ramsey County on an application to close the gap for environmental remediation work at Maryland and Western (by the Willow Reserve) after building materials containing asbestos were found on site. Construction on 11 single family homes for ownership by Habitat for Humanity stalled last summer when the contamination was found. Once funding is secured for clean-up, that work, and laying foundations for the homes will begin. Enjoy a meal or drinks while taking in the view at the Como Lakeside Pavilion. Hours: 11 AM - 9 PM daily. More info and the Music in the Parks concert schedule here. We teamed up with the Library, Rec Center and Rice Street Beat Cops to put on the 2nd Annual North End Summer Kick-Off event on May 23! More than 300 neighbors came to eat, dance, and find fun summer activities going on at Rice Street Library and Rice Rec Center. Thanks to our local business sponsors and city staff for making this event a huge success! Learn more: Library Activities , Rec Center Activities . Visit me on the 1st and 3rd Tuesdays of the month from 4-5:30pm at Rice Street Library! Share your thoughts, ideas and concerns in an informal, drop-in meeting. Wilder Rec Center, 958 Jessie St.
Rice St. Rec Center, 1021 Marion St.